IHG’s Into the Nights promotion has been one of the worst I’ve ever participated in. At first it was all hunky-dory, but that didn’t last long. Just a month after the promo started, they dropped the ball and changed everyone’s requirements. Fortunately, they reverted back to the original requirements a few days later thanks to the outcry on Flyertalk. But wait, that’s not all! This may be an isolated issue, but after the requirement change(s) I finished my original ones only to find out that my account’s requirements reverted again. This lead to a long drawn out conversation with support, another booked night, and the most annoying promotion ever. Frankly, it sucked. If you checked out the timeline above, you probably noticed that I’m still waiting for the points to post from a recent stay. I know I’m cutting this one really close, but IHG’s customer service is terrible, so I didn’t really have any other options. It’s annoying, because I paid more than I planned for this promotion and one of my nights didn’t count. However, At this point, though, I’m just swinging with the punches. How About You? How was your Into The Nights experience? IHG’s Set Your Sights promotion is piggybacking on Into The Nights (it starts 1/1/15 and goes until 4/30/15). 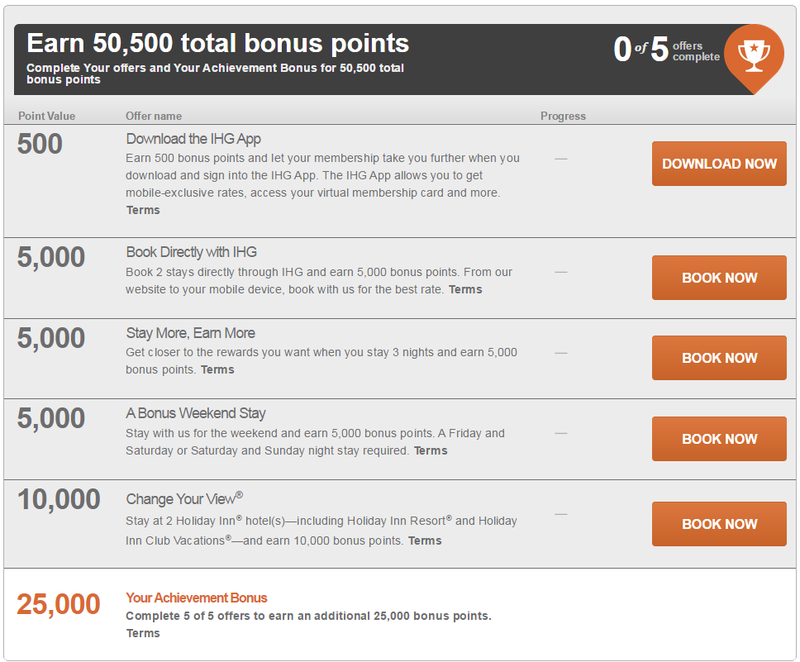 My offers are pretty much exactly the same as Into The Nights, except for that fact that I get fewer points and I don’t have the option for free nights. Realistically, I probably won’t be participating this time around after all the issues I ran into with Into the Nights. Who knows, though, if I find some great rates at my local Holiday Inn(s), I may change my mind. What offers did you get from Set Your Sights? Are you participating?